The president of the TIPNIS, Fabián Gil and the president of the women, Marqueza Teco participated in the mobilization. One of the leaders of the Isiboro Sécure Indigenous Territory and National Park (TIPNIS) marched for the Climate, this Saturday in Germany. Violation of the rights of Mother Earth in its territory will be reported to the International Court of Nature’s Rights. The president of TIPNIS, Fabián Gil and the president of the women, Marqueza Teco participated in the mobilization and will be responsible for presenting their complaint against the Bolivian State and the government of President Evo Morales to the International Tribunal. The court will meet on the 7th and 8th of this month, in its fourth session in which it will hear cases of violation of the rights of nature throughout the world, it will be the indigenous voices in particular who are affected by the damage to their territories, They will express their concerns. This instance will be formed by the judges: Tom Goldtooth, Cormac Cullinan, Osprey Orielle Lake, Alberto Acosta, Shannon Biggs, Simona Fraudatario, Fernando Solanas, also provides for a group of prosecutors. Its resolution has a moral weight for the States. The event is held in parallel to the United Nations Summit on Climate Change (COP23) in Bonn, Germany, where governments intend to reach agreements on this issue. Although civil society has little hope in this instance because of the ineffective results it has shown at the various summits. 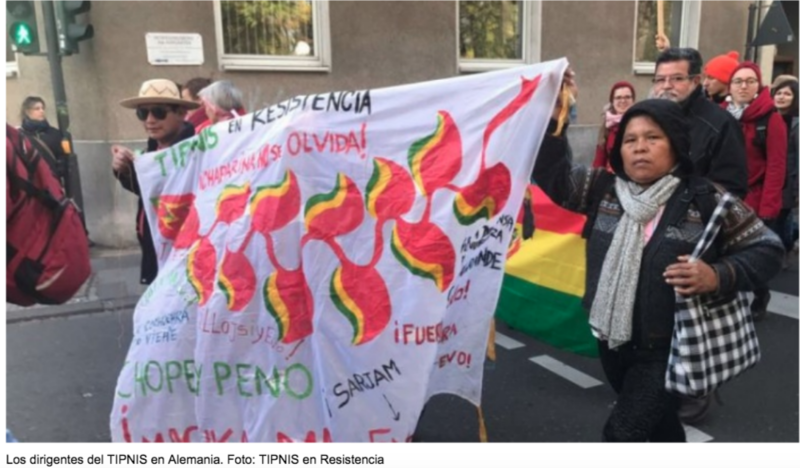 In the Bolivian case, Gil and Teco maintain that the TIPNIS, which has a double condition of indigenous territory and natural reserve, runs the risk that its relationship between man and nature will be affected by the works that the Government intends to build. Since 2011, the central government has postponed the construction of the road through the TIPNIS, for the authorities this road linking the departments of Beni and Pando are strategic for the integration of the country. However, a fraction of indigenous people who question this project believe that it threatens their harmony with the environment and biodiversity. Another fraction of indigenous people have expressed their support for removing the intangibility of the TIPNIS to promote government policies. Bolivian Thoughts opinion: Relentlessly, the coca grower caudillo wants to cut TIPNIS in half, so that coca plantations could have more space to grow and become part of the Chapare stronghold, where NO politicians are allowed to come if they are from the opposition. A number of lynchings has also occurred in the Chapare, it is a region where a regular Bolivian may find problems if they would intend to relocate over there … the reason for that “isolation” the cocaine illegal industry that has replaced law and justice. This government had violently attacked the TIPNIS indigenous march at Chaparina, that is when evo lost all credibility with the indigenous people. I hope the International Court of Nature’s Rights rules against this flagrant damage to the environment and to the indigenous rights of the TIPNIS!